Managing and protecting critical data across servers and applications in multiple locations around the globe is challenging. And the more decentralized and complex your infrastructure, the more difficult it is to manage your data. The potential bad news? Data loss, site outages, revenue loss, and potential non-compliance with regulations. • How Druva can help you drastically improve data protection quality, reduce costs, and simplify global management and configuration? For most organizations, unstructured data is their biggest problem. The need to store all this data is forcing IT to expand primary storage capacities at an alarming rate. Unstructured data not only threatens to break IT budgets, but also force organizations to build new data centers. Organizations are looking to hybrid cloud storage for relief but the cloud has several potential roadblocks to prevent many organizations from leveraging it. Splunk is one of the most broadly adopted analytics applications on the market today. The primary reason for its popularity is it analyzes data that organizations already have, like log and metadata generated from IT operations, enterprise security and various lines of business. Splunk’s popularity though has led organizations to desire to keep more and more of this data so that organizations can improve their decision-making capabilities even further. The desire to keep more data is creating complexity and cost in the underlying infrastructure as IT tries to scale the Splunk environment to meet the ever-growing demand. Join Storage Switzerland and SwiftStack, a Splunk technology partner, for our webinar where our panel of experts will discuss the value of having Splunk analyze larger datasets while providing insight into overcoming infrastructure cost and complexity challenges through Splunk enhancements like SmartStore. As organizations and their employees become more distributed, a case can be made that endpoints (laptops, tablets and smartphones) are some of the most critical pieces of technology in the organization. The problem is most organizations haven’t revisited their endpoint data strategy in years. In fact, some still don’t have a formal strategy in place. In this webinar Storage Switzerland and Carbonite discuss the increased importance of endpoints and why organizations need to upgrade their strategy to make sure these devices are protected, secure and in compliance. In light of increasing legal requirements and potential penalties, organizations can no longer afford to ignore this critical issue. Modern applications process large segments of data, often in parallel. These applications need to match patterns across a multitude of object and vectors or regularly update multiple indices as they change over time. Storage IO and network latency quickly become a hindrance in allowing these applications to reach their full potential. Most IT Planners assume that the only way to address storage performance problems is to buy faster storage systems and eliminate network latency. These approaches only partially address the issues while being least efficient and more expensive. Join Storage Switzerland and NGD Systems for a 15 minute live webinar to discuss an alternative approach leveraging computational storage. It is 2019, why are we still backing up production storage? The simple answer is that most production storage systems can provide some level of data protection but they can’t fully replace backup. It's time to consider what backup independence means. The technology is there for production storage to replace backup but most organizations haven’t fully leveraged it. Join Storage Switzerland and ClearSky Data for our live webinar to learn how to design a self-protecting production storage infrastructure that not only protects data but replaces backup. Artificial Intelligence, Machine Learning and High Velocity Analytic workloads are going mainstream. Enterprises of all types and sizes want to seize the opportunity their data presents. As these workloads move from development to production, organizations face a significant challenge with the supporting storage architecture. At the heart of the problem is the file system the organization will use to store the information. It needs to be fast, scalable, durable and cloud-ready. In this webinar Storage Switzerland and WekaIO will review the various file system options available to organizations looking to create storage architectures for AI, ML and analytics. Most storage consolidation strategies fail because they attempt to consolidate to a single piece of storage hardware. To successfully consolidate storage, IT professionals need to look at consolidation strategies that worked. Server consolidation was VMware’s first use case. It was successful because instead of consolidating hardware, VMware consolidated the environment under a single hypervisor (ESXi) and console (vCenter) but still provided organizations with hardware flexibility. A successful storage consolidation strategy needs to follow a similar formula by providing a single software solution that controls a variety of storage hardware, but that software also has to extract maximum performance and value from each hardware platform on which it sits. Join Storage Switzerland and StorOne in which we discuss how to design a storage consolidation strategy for today, the future and the cloud. For over a decade Network Attached Storage (NAS) was the go to file storage device for organizations needing to store large amounts of unstructured data. But unstructured data is changing. While large file use cases are still prevalent, small file use cases are becoming more dominant. Workloads like artificial intelligence, analytics and IoT are typically driven by millions, if not billions of small files. Object Storage is often hailed as the heir apparent but is it? Can file systems be redesigned to continue to support traditional NAS workloads while also supporting modern, small file and high velocity workloads? Join Storage Switzerland and Qumulo for our live webinar, “NAS vs. Object — Can NAS Make a Comeback,” to learn the state of unstructured data storage and if NAS file systems can provide a superior alternative to object storage. Organizations are moving to the cloud but according to a recent Osterman Research study, only 14% of companies have completed that transformation. The study clearly identifies data storage as an area where IT can easily accelerate their cloud transformation journey. Potentially more so than any other component, intelligently moving data to the cloud has the opportunity to significantly lower on-premises storage costs without the threat of impacting day to day operations. 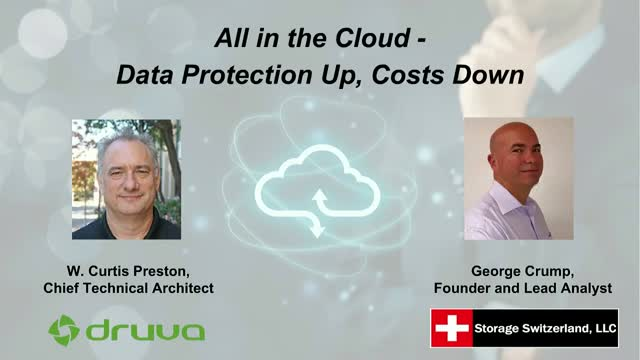 Join Storage Switzerland, HubStor and Osterman Research for our live webinar where we’ll discuss the results of the Osterman Research study, what it means for IT, and how IT can take advantage of that research to leverage the cloud to alleviate data management and data protection concerns. All pre-registrants will receive our exclusive eBook, “Understanding the Difference Between Data Protection and Data Management.” Sign up now and get your copy today. The cloud seems like a logical destination for backup data. It is by definition off-site, and the organization no longer needs to worry about allocating valuable floor space to secondary data storage. The problem is that most cloud backup solutions fall short of delivering enterprise class data protection. Most cloud backup solutions are too complicated to set up and upgrade, don't provide complete platform support, don't provide flexible recovery options, can't meet the enterprises RTO/RPO requirements and don't provide a class of support that enables organizations to lower their operational expense. In this live webinar Storage Switzerland and Carbonite discuss the five critical capabilities that enterprises, looking to move to cloud backup, need to make sure their solution has. 1. Why switch to the cloud for enterprise backup? 2. The five critical capabilities enterprises MUST have in cloud backup solutions. What they are and why enterprises need them. Designing architectures to backup primary storage as well as provide rapid recoveries is a challenging task that most IT professionals need to face. It is even more challenging in the face of a rapidly growing data set, increasing demand for shorter recovery times and new threats like ransomware. The cost for IT to design, implement, maintain and upgrade these infrastructures can consume a big part of the IT budget. Additionally, the time required for each of these steps is something that most IT teams simply don’t have. As a result, many organizations are looking for ways to move to an infrastructure-less architecture where most of the physical hardware is in the cloud as well as the software intelligence. The goal is to move data protection from a very unpredictable CAPEX cost to a normalized OPEX cost. There are an increasing number of cloud solutions that claim an infrastructure-less solution but many of these solutions force the organization to give up many of the capabilities they’ve come to count on or force them into long-term cloud relationships. Attendees to the webinar will learn the challenges of maintaining an on-premises infrastructure, why current cloud solutions fall short and what IT really needs from an infrastructure-less solution. Backup software is continuously improving. Solutions like Veeam Backup and Replication deliver instant recoveries, enabling virtual machine volumes to instantiate directly on the backup device, without having to wait for data to transfer back to primary storage. These solutions can also move older backups to higher capacity, lower cost object storage or cloud storage systems. To deliver meaningful performance during instant recovery without exceeding the backup storage budget requires IT to re-think its backup storage architecture. Modern backup processes need high performance, low capacity systems to deliver high-performance instant recovery, as well as high-capacity, modest performance systems to store backup data long term and software to manage data placement for the most appropriate recovery performance while not breaking the budget. Edge Computing, often referred to as Distributed Cloud, is becoming a requirement for a set of new application use cases revolving around IoT, AI/ML and other new technologies requiring ultra low latency, data thinning to reduce bandwidth costs, autonomy, and privacy. These drivers mean that data center operators need to rethink their networking infrastructure as they plan for and deploy edge compute which will result in an explosion of mini- and micro-data centers. New approaches leveraging open networking, next generation SDN fabrics and network automation are required to simplify, manage and troubleshoot their increasingly distributed network infrastructures. Join Storage Switzerland's Lead Analyst, George Crump and Pluribus Network's Mike Capuano for our on demand Lightboard webinar, "Using Next Generation Network Fabric for Your Distributed Cloud." Reducing or a least slowing the growth of storage costs is a top priority facing IT organizations in 2019. In this live webinar with Storage Switzerland and SolarWinds, you will learn the three steps IT professionals can take to lower storage costs WITHOUT buying more storage (the typical vendor answer). The biggest challenges are that IT professionals don't arm themselves with the tools they need to be successful, take the next step in their career path and of course, save their company money. Most organizations use Network Attached Storage (NAS) to store data, but the modern workforce and organization expect more capabilities than what the typical NAS can provide. Also, as organizations themselves become more distributed, the idea of a single centralized file server with users tunneling through virtual private networks won’t scale. The common alternative, putting a NAS in each remote office offers problems of its own when IT tries to make sure the data is protected and made available to the right users at the right time. NVMe storage systems and NVMe networks promise to reduce latency further and increase performance beyond what SAS based flash systems and current networking technology can deliver. To take advantage of that performance gain however, the data center must have workloads that can take advantage of all the latency reduction and performance improvements that NVMe offers. Vendors emphatically state that NVMe is the next must-have technology, yet many still continue to provide SAS based arrays using traditional networks. How do IT planners know then, that investing in NVMe will truly provide their organizations the benefits of NVMe for their demanding applications and see a measurable return on investment? Just creating a test environment to perform an NVMe evaluation can break the IT budget! Register now to join Storage Switzerland, Virtual Instruments, and SANBlaze as we look at the state of the data center and provide IT planners with the information they need to decide if NVMe is an investment they should make now or if they should wait a year or more. The key is determining which applications can benefit from NVMe-based approaches. If you think the cloud provides enough protection for your critical data, you’re putting that data at risk. You can’t assume data is protected because it’s “in the cloud” -- you need to ensure all of the data in your critical applications, including Office 365 and Salesforce.com, get the protection they deserve. - What level of protection do cloud services provide? - Is the provided level of protection enough for the enterprise? - What does the enterprise need to add to achieve complete protection? Most data centers still use a legacy DR strategy of replicating or even physically transporting backups to a dedicated disaster recovery (DR) site, or a secondary site owned by the organization. Disaster Recovery as a Service (DRaaS) delivers a compelling alternative to traditional DR, return on investment (ROI). It eliminates the costs associated with a dedicated disaster recovery site like paying for and equipping the site. Organizations though are hesitant to transition to DRaaS following the “if it ain’t broke, don't fix it” philosophy. In this live 15 minute webinar join Storage Switzerland, Veeam and KeepItSafe to learn how to transition from a legacy DR strategy to DRaaS without risking data protection downtime. Software Defined Data Centers (SDDC) leverage intelligent software to manage commodity hardware to create a flexible data center that meets performance and capacity requirements while simplifying operations and reducing overall data center costs. While the vision of SDDC sounds ideal for organizations, its execution is less than ideal. Storage remains a significant roadblock for organizations looking for a software-defined future. Join Storage Switzerland and Datera for another episode in our 15-minute webinar series, “Will the Software Defined Data Center Ever Happen,” to learn the concept behind SDDC, why it has stumbled out of the gate and what IT Professionals should be demanding from SDDC vendors to deliver the SDDC promise. Tune into Storage Switzerland's channel to learn from this analyst firm focused on storage, virtualization and the cloud. Storage Switzerland’s goal is to provide unbiased evaluations and interview content on sponsoring and non-sponsoring companies through articles, public events and product reviews.